BlackRock CEO Larry Fink has been vocal in telling the CEOs of companies in the S&P 500 to invest in their people and other assets. BlackRock, the world's largest asset manager, is placing big bets on healthcare stocks. The giant New York money manager with more than $4.5 trillion under management took large positions last year in at least 14 investor-owned healthcare companies ranging from Tenet Healthcare Corp. and TeamHealth on the provider side to insurer Centene Corp. and a host of medical-device and equipment companies. The new ownership stakes taken by BlackRock were revealed in regulatory 13G filings made last month with the U.S. Securities and Exchange Commission. The filings are triggered at year-end when an investor owns 5% or more of a company's common shares. In reviewing 13G forms filed by BlackRock on each of the 14 companies, Modern Healthcare estimates that BlackRock and its subsidiary funds invested millions of dollars in the common shares of the companies throughout 2015, including the fourth quarter. As of Dec. 31, BlackRock's shares in the 14 companies totaled more than $9.6 billion in value. For several companies, including medical device firm Stryker Corp. and dialysis chain DaVita Healthcare Partners, BlackRock broke the 5% ownership threshold. For others, BlackRock already owned at least 5% and was building its investment further. BlackRock does not comment on individual stocks or holdings, spokeswoman Olivia Offner said. She said the firm also declined to comment on the analysis. It is unclear whether the investments are relatively passive or if BlackRock intends to use its enhanced ownership in any of the companies to encourage governance or operational changes. Analysts interviewed for this story said the former motivation is more likely and saw the BlackRock investments as a good sign for the sector. Several of the 14 healthcare stocks had seen their prices fall during the summer and autumn when companies such as Tenet saw their earnings plunge on a flattening of insurance exchange volumes and general nervousness around the Affordable Care Act. Other economic factors, such as China's struggles, depressed U.S. stocks. BlackRock may have seen the widespread stock price declines among the group as a buying opportunity, said Brian Wright, a healthcare analyst at Sterne Agee CRT. “It sounds like BlackRock was astutely taking advantage of weakness in the stock to own a greater percentage of the company,” Wright said when specifically asked about the higher stake in Centene, a Medicaid managed-care company. Centene—which is on the precipice of closing its $6.8 billion merger with Health Net, another company in which BlackRock has more than than a 5% stake—saw its stock drop to less than $53 per share in late September after topping $81 last June. At a gathering of Wall Street analysts last month hosted by the Nashville Health Care Council, Frank Morgan of RBC Capital Markets said sector stocks had been oversold and that investors would soon start buying and put a floor under share prices. BlackRock is on the radar of nearly every CEO leading a major American corporation. The asset manager, for example, is one of the five largest shareholders of such giants as Google, Apple and Facebook. 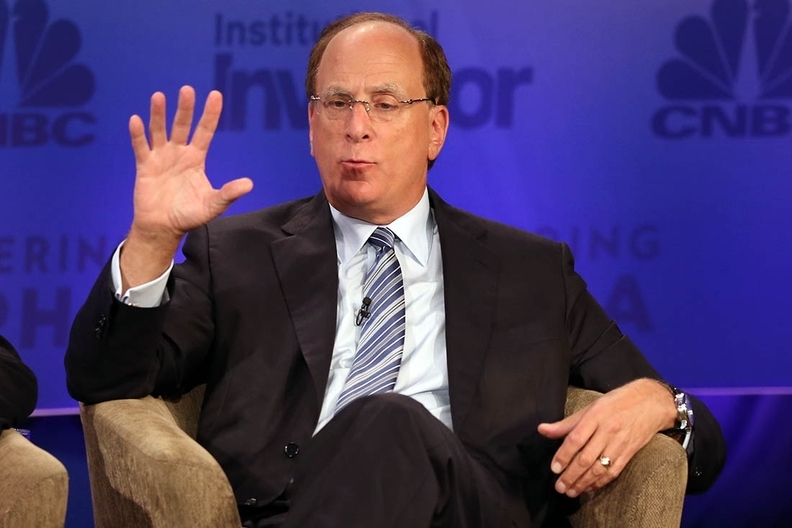 BlackRock CEO Larry Fink is a major player on Wall Street and has been vocal in telling the CEOs of companies in the S&P 500 to invest in their people and other assets rather than trying to boost share prices with quickie tactics such as stock buybacks. But senior managers at the 14 healthcare companies can't be blamed if BlackRock's stock-shopping spree makes them a little nervous. While most 13G disclosures like the ones signaling BlackRock's rising healthcare holdings don't lead to activist behavior, 13Ds do. In January, Tenet's board of directors created two board seats for Glenview Capital Management when the hedge fund accumulated an 18% stake in the hospital chain, according to a 13D regulatory filing. Glenview and Tenet say the developments are friendly and helpful to raising shareholder value at Tenet. But Glenview's influence could become more activist. After a year, Glenview could gain two additional Tenet board seats if it keeps its holding above 10%. Last quarter, BlackRock raised its stake in Tenet to 8.8%.